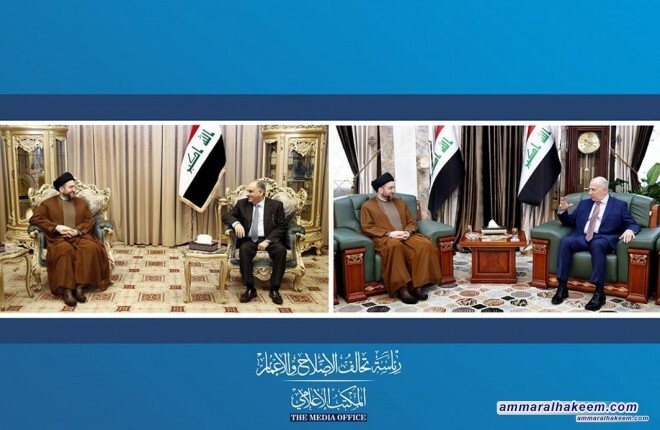 His eminence discussed developments of the political situation and institutionalization of the Reform and Reconstruction Alliance, and his eminence received congratulations for being elected as head of the Reform and Reconstruction Alliance. His eminence stressed the necessity of completing the institutionalization of the Alliance through the defining and distribution of tasks and roles, plus forming internal committees in order to coordinate and unify visions of legislation and monitoring aspects. Regarding governmental aspects, his eminence pointed out supporting the government in achieving its development plans, and renewed his call to complete the government cabinet, stressed on provision of services, job opportunities and the fight against corruption. Regarding Arab and regional masters, his eminence stressed the importance of meetings and presenting the accumulated accomplishments and positive achievements achieved by Iraq.